MPE Intrinsically Safe - B&M Technical Services, Inc. 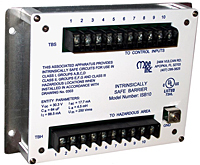 The Intrinsically Safe Relay ISR provides a safe and reliable method of load control when interfaced with a contact closure in a hazardous location. When the control switch input is closed between pins 1 and 8, the output relay becomes energized, and the LED is illuminated. When the control switch input is open, the output relay is de-energized, and the LED is turned off. It provides intrinsically safe circuits for use in Class I, Groups A, B, C, D Class II, Groups E, F, G and Class III - Hazardous Locations. 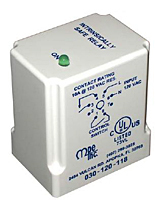 The socket is included with the Intrinsically Safe Relay. The ISB10 provides an intrinsically safe barrier ISB between a 10 channel conductance probe in a hazardous location and pump controls in a non-hazardous area. The barrier is designed to allow the level sense signal (±12V square wave) from the pump control device to pass through unchanged. If an accident or malfunction occurs in the control panel that would potentially connect spark-inducing energy to the probe wiring in the wet well, the barrier clamps to limit the voltage and current to a safe level. The barrier has a fuse in each channel that is capable of disconnecting the barrier from a high energy source that may be present in the control panel.